The sixth edition of the Annual Impact Investor Survey is based on an analysis of the activities of 158 of the world's leading impact investing organizations, including fund managers, foundations, banks, development finance institutions, family offices, pension funds, and insurance companies. The survey provides detailed insight into investor perceptions and a number of key market variables such as types of investors, the number and size of investments made, target returns, attitudes towards liquidity and responsible exits, and impact measurement practices. This "State of the Market" analysis explores how investments continue to be made across different geographies, a range of sectors, and multiple asset classes, signaling continued market growth and an increasing interest in impact investing opportunities. J.P. Morgan is an anchor sponsor of the 2016 survey. The study was also produced with support from the U.K. Government through the Department for International Development's Impact Programme. 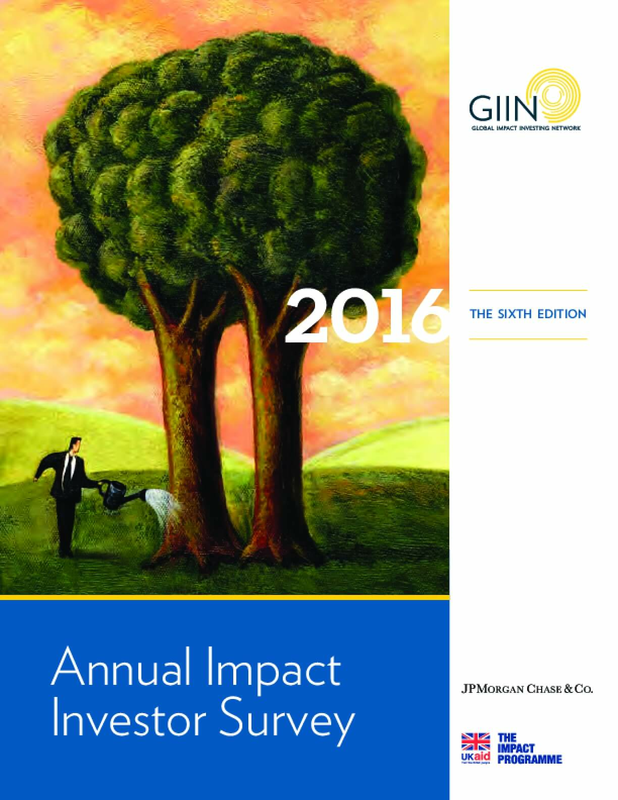 Copyright 2016 by Global Impact Investing Network (GIIN). All rights reserved.